11 calibrators in one. Fluke pioneered the multi-product calibrator concept, creating a tool that allows you to calibrate the widest range of today?s electronic test tools with a single instrument The 5520A builds on the 5500A?s capabilities, extending its workload coverage even further. Its improved accuracy, expanded ranges, and added features, including current to 20A and pressure measurement, as well as its capability to calibrate 51⁄2 and 61⁄2 digit multimeters, means the 5520A can cover virtually all your high-performance workload. Both models offer options to fully calibrate oscilloscopes to 300 MHz or 600 MHz. 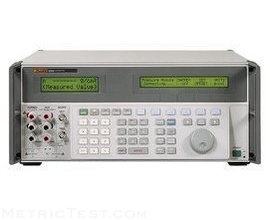 The 5520A also offers an option to fully calibrate oscilloscopes to 1.1 GHz. Both the 5500A and the 5520A are built to Fluke?s high standards for rugged durability so you can use them easily on or off the bench. And they feature extensive self-diagnostics to help isolate problems to the module level.